This pertinent book assists occupational therapists and other health care providers in developing up-to-date psychogeriatric programs and understanding details of treating the cognitively impaired elderly. There exists a significant demand for occupational therapy in psychogeriatrics now. As the elderly population increases, especially elderly requiring rehabilitative care, the need for occupational therapy in psychogeriatrics will increase markably. 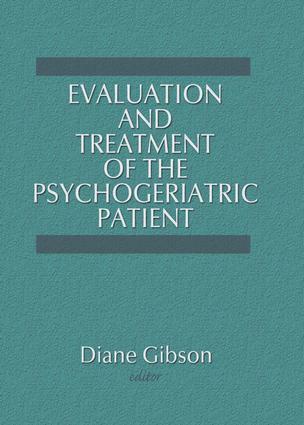 Evaluation and Treatment of the Psychogeriatric Patient emphasizes the expertise of leading psychogeriatric occupational therapists, focusing on transitional programming, treating cognitive deficits, and recognizing the malignant cultural myths which continue to disenfranchise and denigrate the elderly. Appropriate diagnosis and management of the elderly population is vital to their ability to function independently. Through detailed, operationally useful descriptions of current geriatric day care hospitals and psychogeriatric transitional programs, this book will be an invaluable aid for social workers, nurses, geriatric counselors, and physical therapists. These helping professionals will be better equipped to develop up-to-date psychogeriatric programs and will better understand the details involved in treating the mentally impaired elderly.